It’s difficult to conceive of a Predator movie without an actual Predator, but that’s exactly what you get in the 1988 Italian action movie, Robowar. Imagine the pitch meeting for a project like this. “Look, guys, Predators are cool and all, but we don’t have the budget to create a monster like that. 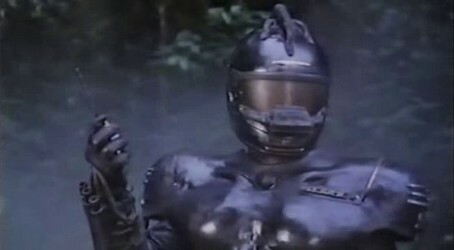 What if we replaced the actual Predator with a crazy soldier robot in the jungle?” By all means, greenlight that. It’s so stupid, it just might work! Spoiler alert: it doesn’t work. The maniacal robot in question is called Omega One and it was created to wipe out guerillas on the island of Batu Batu, surely the greatest threat to peace in our time. Once deployed, Omega One’s electronic brain gets a few wires crossed. It begins destroying everything in sight, including a helicopter belonging to the military branch assigned to control it. Someone has to stop the deadly droid from rampaging through the tropics, so a special team of mercenaries is assembled to neutralize the threat. This team was specifically chosen to look like Arnold Schwarzenegger’s team in Predator, but weaker and more stupid. 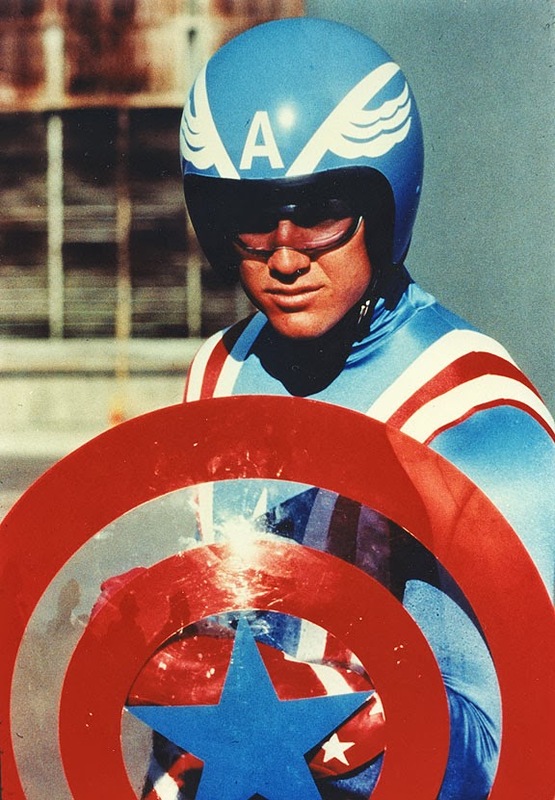 TV’s Captain America, Reb Brown, plays leader Marphy Black. I know, I wanted his name to be Murphy, and his teammates consistently refer to him as Murphy, but the closing credits clearly say Marphy, so we’re going with that. The rest of the team falls into familiar stereotypical roles. Black martial artist guy, Asian Zen tracker guy, half-crazy guy with a machine gun guy, mysterious military adviser who tags along with the commandos guy; they’re all here, and they all have dumb nicknames like Kill Zone and Diddy Bop. You know the bad guys quake with fear when they hear Diddy Bop’s comin’ for ’em. Once our Predator cosplayers are established, they put on their camo and venture into the thick Venezuelan jungle. They think they have been assigned to wipe out a guerilla base camp. They don’t know about Omega One. It’s a secret mission inside a secret mission, so black ops that these guys don’t even have a map. There are multiple scenes of these muscle-bound schmucks wandering through green hell, staring up into the trees, communicating with hand signals. When they do speak, it’s with ersatz tough-guy talk. One soldier urges another to move faster by saying, “You walk like a ruptured duck.” Do you laugh or get angry at something like that? The team starts finding bodies with their guts scooped out and the skin stripped off their bones. The first time they find one of these steaming skeletons, one man says, “Can’t you see he’s been dead for days?” Intelligence is not this group’s strong point. Every time they hear a noise, they start firing machine guns in that general direction. Not just one guy. All the guys. Hell, if one soldier starts shooting, the rest of them rush to his side and start shooting, too. And with the shooting comes the yelling, because machine guns aren’t loud enough. Remember when Bill Duke and the rest of Dutch’s boys mowed down 700 trees with M-16s and a pulse rifle in Predator? There are reenactments of that scene, on a smaller scale, about eight separate times during the movie. When they do find the guerilla headquarters, they don’t really aim at anybody. They just squeeze the trigger and move from side to side, yelling, indiscriminately spraying bullets everywhere. No short bursts of suppressing fire here. It’s amazing they actually hit anything. They’re like gunfire lawn sprinklers, and they never run out of ammo. They don’t even stop to reload! The law of averages is on their side so they eventually kill everyone and blow up all the thatched-roof buildings. That’s when Omega One shows up on a hillside, and it uses its laser weapons to blow up the buildings that we just watched the stupid soldiers destroy! Omega One does that a lot in Robowar; it destroys things that have already been obliterated. It must have poor self-esteem, feeling the need for oneupsbotship. Omega One has a lot of problems, to be frank, and the main one is that it is silly. It walks like Woody Allen in Sleeper and looks like a Tomy toy from the late 70s. It sees everything in highly pixellated 8-bit vision and, weirdest of all, it talks to itself. The whole point of the movie is that this thing has gone offline so it is giving itself orders, which the viewer is able to hear. After each command, Omega One says the word, “Received.” Example: “Acquire target! Received!” Well, of course you received the order, dummy. You gave it to yourself! It doesn’t help that its voice sounds like Twiki from Buck Rogers. How are we supposed to take this thing seriously as a threat? If they had left the bloody thing alone until its two AA batteries ran down, there wouldn’t have been a problem. And why is it so hard to find the shiny metal thing when everything around them is green? It can’t be hard to spot. Really, all they have to do is blow something up, then wait until Omega One arrives to blow it up again. The soldiers walk. They shoot. They scream. They gesture at each other. It’s a bizarre combination of Apocalypse Now and The Lord of the Rings. They don’t know where they are, we aren’t sure what they’re doing, and it all becomes an awful travelogue with guns and a crafty robot. Before we had The Asylum to make movies ripped off from other better films, that was the forté of the Italians. Robowar was directed by Vincent Dawn, the pseudonym of sleazemaestro Bruno Mattei, most famous for gore movies like Hell of the Living Dead. He cranked movies out fast and cheap, and Robowar is no exception. The movie follows Predator beat for beat, ripping off entire scenes wholesale. At one point, the Asian Zen tracker guy takes off his shirt, brandishes his combat knife, and screams into the trees right before he dies off-screen. Well done, Not Sonny Landham. Robowar is pointless and interminable, but it works as an insane example of 80s machismo. From the scene where Marphy Black arrives on the island wearing a sky blue crop top and matching pleated slacks to watching his team standing in V-formation firing their magic eternally loaded guns into palm trees while bellowing, Robowar is all testosterone and no brains. It’s the film equivalent of human growth hormone. Robowar is available on Prime Video, but why wouldn’t you just watch Predator?